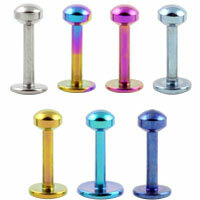 Hypoallergenic titanium labret studs secured by 3mm diameter and 2mm high screw-on disks. The flat back makes these studs particularly comfortable to sleep in. Lovely simple jewellery. Look good, easier to do up because of the shape, great value, hypoallergenic, helpful seller, what’s not to love? Buy these if you’re even slightly thinking about it, you won’t be disappointed! Lovely to look at and very comfortable to wear. I needed to find an item that I could sleep in and that didn't give me a rash. This is the one! Great quality earring with a deep thread. I have lost many earrings because the ball worked itself away from the post but this earring is really secure. It is great quality and looks fantastic. I hadn't been wearing earrings very frequently in the last couple of years and was finding that whenever I wanted to wear a pair the holes were partially closed. 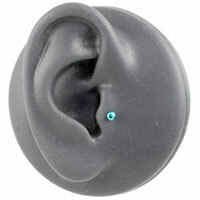 Once I'd managed to get a pair in my ears would sting for a couple of days. After being given a lovely pair of earrings for Christmas I decided to sort out the problem by getting a simple pair of studs I could leave in for a couple of weeks at least. I did a little research and found this store and I'm so glad I did! The labrets were delivered within a couple of days even though it was over the holidays and I've had them in ever since bar the occasional cleaning - they are the most comfortable earrings I've worn in a long time, are great to sleep in, and look subtly cute for day to day wear. I'm very impressed, thanks! A fast delivery and the item was just as I excepted it to be. 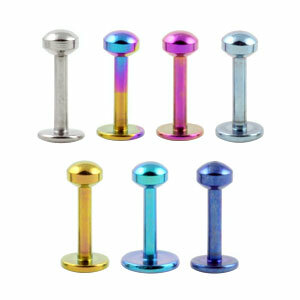 Very good product, service was excellent and received in a few days. 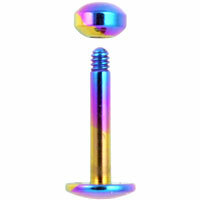 These are beautifully coloured, easy to fit and look awesome! So fun! Prefect size, finally can wear earphones better!